Psalterium, Hebraeum, Grecu[m]. Aragicu[m], & Chaldeu[m]: cu[m] Tribus Latinus I[n]terp[re]tato[n]ibus & Glossis...Genuae. [Genova]: Petrus Paulus Porrus, 1516. The polyglot tradition emerged from the scholarly ad fontem, or return to the sources, movement. The columnar format allowed biblical scholars a convenient way to simultaneously view all available versions of scriptures. The polyglot emerged from extant biblical study traditions: parallel columns of Hebrew and Aramaic had long been used by Jews, and the format was brought to Europe when Aldus Manutius employed Hebrew printers. Robert Estienne had published a Hebrew-Latin Quincuplex Psalterum in 1509, and the famed Complusian Polyglot Bible developed from 1514 to 1517. However, this Genovese quadroplex psalter was the first true polyglot to circulate. The polyglot movement endured into the seventeenth century, and exerted a major influence on later translations into Vulgate tongues. 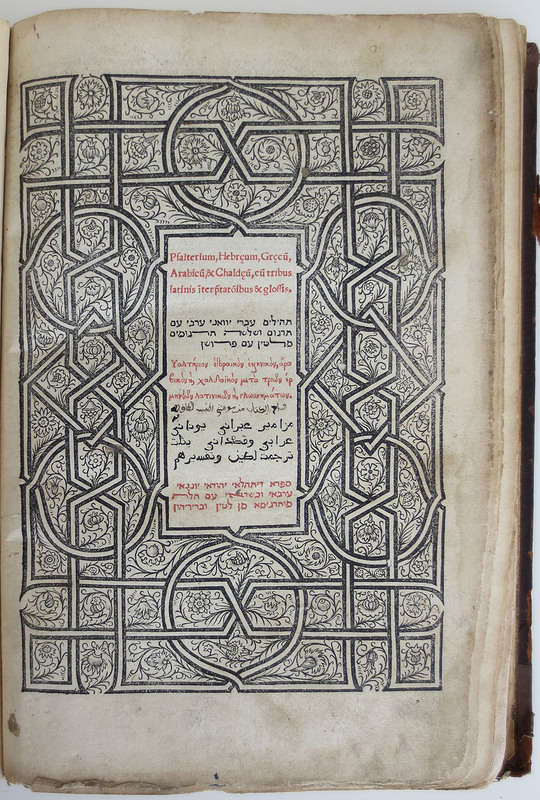 This psalter was licensed by the Archbishop of Genoa on January 29, 1510, and appeared on August 1, 1516, printed in red and black with Hebrew, Roman and Arabic types. 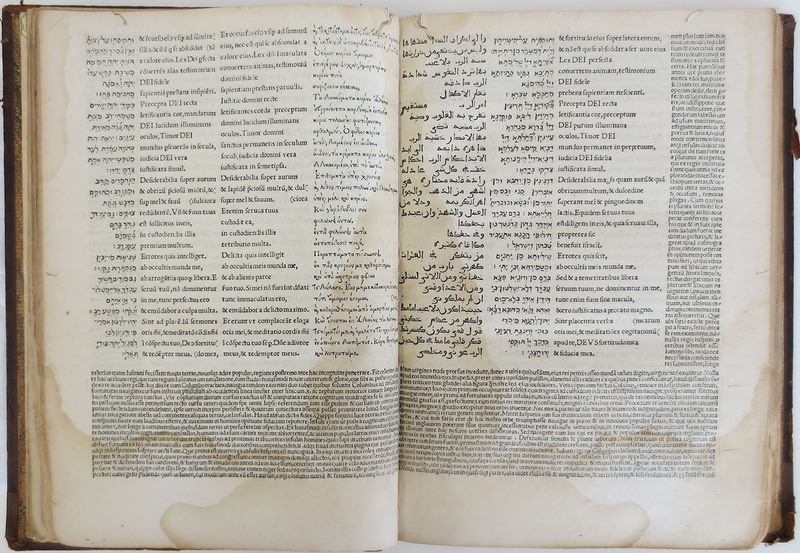 The text was arranged in a four column doublespread reading from left to right, including Hebrew, literal Latin translation of the Hebrew, Latin Vulgate, Greek Septagent, Arabic, Aramaic in Hebrew characters, and literal Latin translation of the Aramaic. The use of Arabic type, which was brought to Italy by Pope Julius II in 1514, is notable. Even more notable are the four pages of scholia surrounding Psalm XIX.4 which provide the first biographical sketch of explorer Christopher Columbus and an account of his discoveries. The account's accuracy was later challenged by Columbus' son, Ferdinand, and the Psalter was ordered destroyed by the Genoa Senate. However, enforcement was lax, and numerous copies of the Psalter survived the decree.